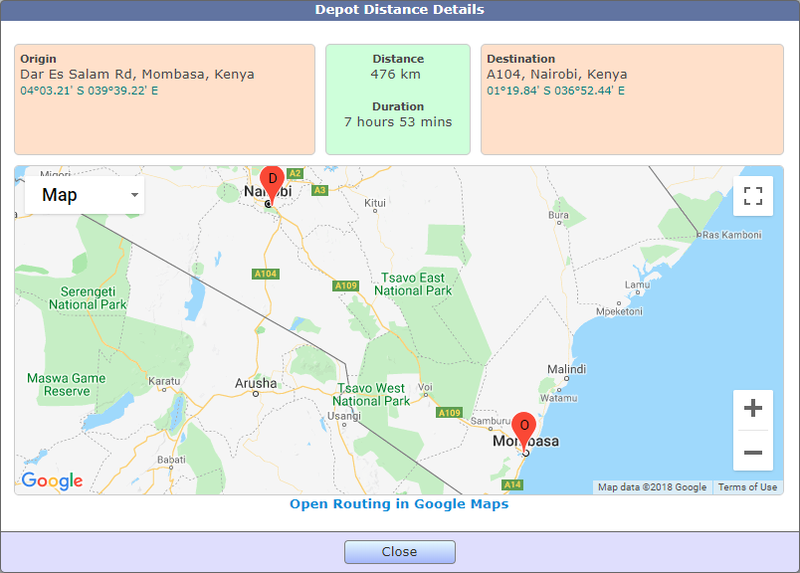 TrakIT can use the Google Maps API to calculate the driving distance between two depots. To enable this feature, make sure you have set the locations of the depots in Admin > Geography & Access. Only Administrators have access to do this. On the Work Order where you need to calculate the distance, make sure the Origin and Destination depots are set in the Header. Then, click 'Depot Distance' from the WO Menu. This opens a popup displaying the Origin and Destination Depot locations as well as the addresses (if found). It displays the kilometer distance as well as the driving time between the two locations. The driving time is based on current traffic conditions. Click the Open Routing in Google Maps link below the map to open another window in which you can see the full details of the route and also plan alternate routing. 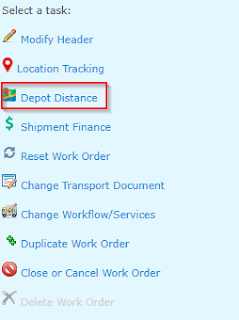 If any of the depots is missing from the work order or doesn't have its location set, the distance cannot be calculated. For any questions or information, please contact TrakIT Support. With the latest update, we have added Data Fields for Entities. This option has been added for all the entities under Entity management and is to be used for storing any extra data about entities that isn't present in the header fields. For example: Contract Expiry, Account Manager, Secondary Address, Etc. You can create any number for data fields for each Entity Type. To create Entity Data Fields, go to Admin > Master Tables and select "Data Field Definitions". Select "Entity Fields" and then the Entity type from the drop downs. Click the create button to add new Fields each with a unique name and code. All these data fields will be shown under Entity Data tab on the Entity Detail page for specific entities.